In one of the previous articles we started the story about dental implants. In this article we will attempt to describe the entire implant therapy procedure. The first part of the implant is surgically implanted into the bone. This procedure is done under local anesthesia and it takes a short time to finish. After placing the implant there is a healing period while the implant stays in the bone and ‘rests’. The implants in the lower jaw rest in the jaw for 3 months while the implants in the upper jaw usually rest for 6 months so the implant can fully integrate into the bone. This period can be longer or shorter on a case to case basis, and it depends on the therapist’s professional decision. In that time the implants are inside the bone matter and they’re covered with a mucus membrane so they’re ‘invisible’ inside the mouth. Sometimes it’s immediately possible to place a temporary prosthetic solution (crown, bridge) which lets the patient retain normal chewing functions and a temporary esthetic solution if the situation involves a missing tooth in a visible position. When 3 or 6 months pass the implants are ‘opened’ once again. The mucus membrane over them is removed and caps are set up so the soft tissue around them can heal and form in a way that will imitate natural protruding of the tooth from the gums in a best way. The caps remain on the implant for 15-20 days after which they are taken off and we take a print that is used to manufacture the final prosthetic solution. We can use implants to replace one or several teeth. 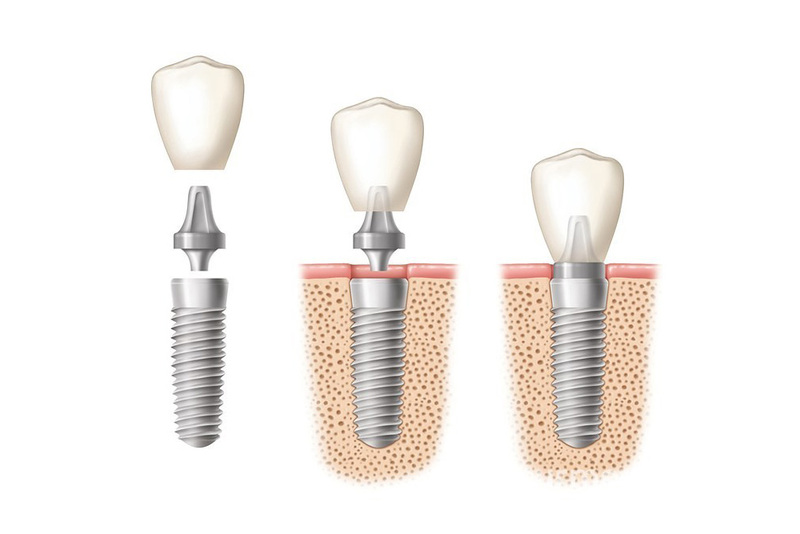 We can use two or more implants depending on the situation, where we use the implants to reinforce the prosthetic piece. This proved to be an excellent solution for a total lower dental prosthesis and it solved the problems that patients had with wearing it. As you can tell, the possibilities of prosthetic rehabilitation are quite significant and they also include the possibility of implanting the entire (toothless) jaw with a fixed prosthetic work or, in other words, a bridge. When patients decide about the implant therapy they are often interested in how long-lasting this solution really is. It’s incorrect to think that implants can’t be damaged after a prosthetic solution is set up! When we’re talking about long lasting implant and prosthetic solutions, one of the most important factors is hygiene. In addition to normal toothbrushes it’s also necessary to use additional means of oral hygiene (interdental brushes, dental floss…) and you should be educated how to choose and use them by your dentist. Naturally, regular check-ups decided by the dentist are also very important. We hope that we clarified the implant procedures in this article and that it will make it easier for you to decide whether or not you want this type of treatment. For any additional questions feel free to contact us, or simply make a first appointment.